For guests at a landmark hotel in the Big Apple, ordering breakfast in bed that gets wheeled in on a silver platter will soon be a thing of the past. New York Hilton Midtown in Times Square, the biggest hotel in New York City, with nearly 2,000 rooms, says it will eliminate room service starting this summer. This isn't the first Hilton property to get rid of room service: Hilton Hawaiian Village stopped offering it in the fall. "Like most full-service hotels, New York Hilton Midtown has continued to see a decline in traditional room service requests over the last several years as customer preferences and expectations continue to evolve," a New York Hilton Midtown representative said. The move will cut 55 jobs. In the place of room service the hotel is trying a new concept: a cafeteria-style restaurant called Herb n' Kitchen. The self-service model offers options such as flatbread pizzas, sandwiches, and gourmet coffee. The staffing needs of the new concept are still being evaluated, the hotel said. Mark Woodworth, president of the hotel consulting firm PKF Hospitality Research, said this type of change is in line with what has been evolving for quite some time in the lodging industry. "More and more consumers prefer to 'help themselves' to what they need, and the increased use of automated check-in/check-out kiosks and complementary buffets are common examples of this," Woodworth said. "If management is providing a service that, at best, is only marginally valued by the guest, then there is a strong motivation to end such a practice." In 2012, room service revenue represented 1.2% of total hotel revenue, down from 1.3% the year before, according to an industry survey by PKF Hospitality Research. Travel + Leisure News Editor Amy Farley says Hilton's game-changing move could set a precedent for other hotels. "Expectations for travelers evolve," she said. "Two decades ago it would have been unheard of for a major airline to not serve food, and now we're used to taking our credit cards or bringing food with us. "Travelers are evolving to the point where they understand hotels to be full service even if they don't offer room service." Some hotels are offering a new approach to room service altogether. In February, The Hudson Hotel in midtown Manhattan introduced the Hudson Common Express, a burger joint that offers the option of take-out or delivery of items like French toast, grilled cheese, egg and maple braised bacon sandwiches and kale Ceasar salad. The Grand Hyatt in New York's Times Square scaled back its room service hours and has a gourmet 24-hour market as an alternative. The Public Chicago hotel's Public Express offers gourmet meals designed by Jean-Georges Vongerichten, of New York's Jean-Georges restaurant, delivered in a brown bag at "lightning quick speed" to guests' rooms any time day or night. "This casualization of fine dining is partly due to the economy but it's also a way that we're evolving," Farley said. "We know that we can have an excellent meal at a farmhouse table and this extends to hotels. They'll rethink the white tablecloth and will instead offer room service in a box with no fancy silverware." 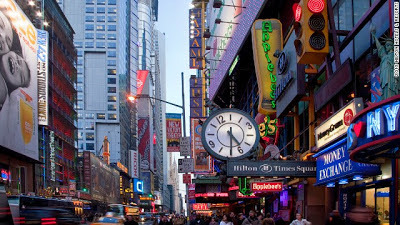 New York Hilton Midtown said the Hilton chain has no current plans to roll out the initiative more broadly.